Wavestream designs and manufactures next generation solid state power amplifiers for mission-critical satellite communication systems. As a merchant supplier to the world satellite communications market, Wavestream sets the standard in the design and manufacture of next generation high power solid state amplifiers for integration in to mission-critical Ground, Sea and Air Borne satellite communication systems. Wavestream’s innovative technology and engineering expertise has fueled the company’s rapid growth and product expansion to address the increasing demand for more efficient and reliable solid state amplifiers. Our patented Spatial advantEdge™ technology allows us to deliver both outdoor and indoor products that offer high power output in smaller, lighter weight packages than traditional tube and other solid state amplifier solutions available today. Through constant innovation and research, Wavestream provides customers with unique solutions that use less energy, reduce lifecycle costs, and offer a clear technology insertion path to replace aging, less efficient amplifiers deployed in satellite communication systems. Our team of research and design engineers, technicians and support personnel take great pride in designing products that meet the specific requirements of our partners worldwide. Wavestream’s state-of-the-art manufacturing and production facilities, comprehensive quality and testing procedures, support services ensure customers receive the highest quality, most reliable products on-time, every time. 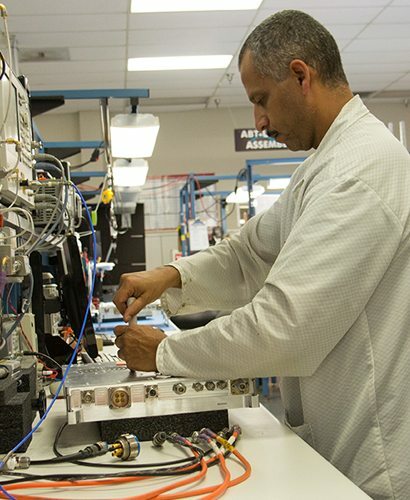 Our products are field-proven, with thousands of Ka-band, Ku-band and X-band products in use today supporting Commercial and military Ground/Mobile, Gateway and Inflight Connectivity products for integration into satellite communication systems. When compact size and lighter weight is critical, when energy efficiency is paramount to reducing costs, and when reliability is essential to long-term system maintenance, Wavestream Ka, Ku, and X-band products have become the choice to get the job done.